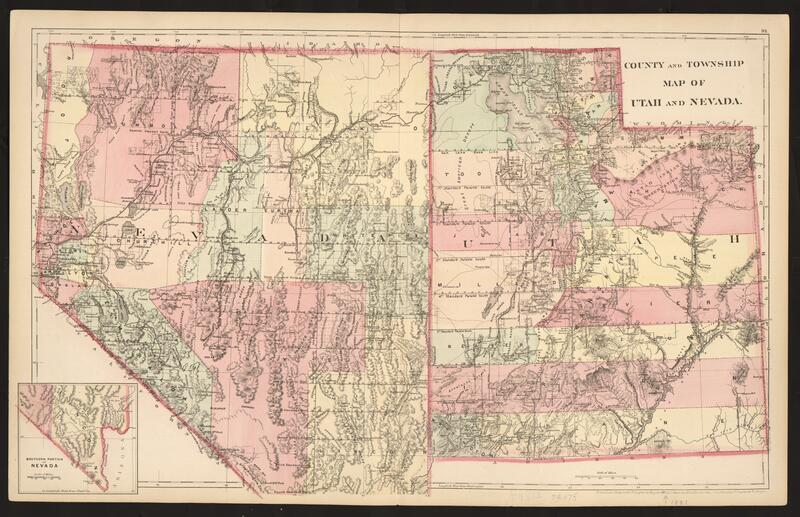 County and township map of Utah and Nevada; S. Augustus Mitchell. Relief shown by hachures. Prime meridians: Greenwich and Washington. At lower right: "Entered according to Act of Congress in the year 1881 by S. Augustus Mitchell in the Office of the Librarian of Congress at Washington." Plate 91 from Mitchell's New General Atlas, Containing Maps Of The Various Countries Of The World, Plans Of Cities, Etc., Embraced In Ninety-Three Quarto Maps. Shows county borders. Includes inset of southern portion of Nevada. 1 map: col.; 36 x 55 cm. This map is in the public domain. Please attribute access and use of this digitized map to the Stephen S. Clark Library, University of Michigan Library.